Swami Vachanananda returned from Karnataka a day or two ago and yesterday appeared in my English class for the first time in more than a month. Swami Veda is back in India and will be here in Rishikesh sometime this week, so gradually everyone is returning to the ashram, including new teaching staff, new students, etc. Vachanananda was full of stories, so rather than have a regular English class, I made it a mock press conference and had the students pose as reporters and ask him questions. Since they won't actually write anything (I gave them another assignment), I am summarizing a little, plus giving some background. 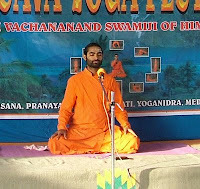 Swami Vachanandanaji is only 25 but has been a sannyasi in the Lingayat or Virashaiva tradition that is mainly based in the Karnataka region. Before he was born, his parents had three girls. They went to see a Lingayat guru who told them they would have a son, but that he would be a sadhu and would renounce home life. When the mother was pregnant, the guru gave "garbha-diksha" to the infant and told the mother that throughout the pregnancy she was to chant this mantra. He also gave a ishtalinga, which is the sect's symbol and worn by everyone. When the child was born, she was to repeat the mantra to the child before giving him her breastmilk. Then a few days later, the guru came and performed the Lingadharana ceremony. But he stipulated that the child was to belong to the guru. This was a very serious commitment, especially in that family, since Vachananda's grandparents had made a similar deal with this guru's guru, and had reneged on it. Actually the deal had been made by the father without telling his wife, and when she had twins she could not bear to part with them. The two boys were extremely talented, brilliant, musical, etc. But not long after this refusal, they both died. The parents were devastated, but they did not lose faith in their spiritual master and dedicated themselves to serving in his ashram for the rest of their lives. Anyway, Vachananda was educated in various Lingayat schools and ashrams and finally given sannyasa after he finished college. He is a charismatic fellow and though his English is still imperfect, he has a vast knowledge of the literature of his own tradition and is a very good speaker in Kannada. This summer he was invited by some sponsors to lead a series of yoga camps in Karnataka. Over a six week period he lectured to thousands of people and gave yoga and meditation classes to about 600 people, mostly college students. As a matter of fact, his success was noticed by various Lingayat leaders, and according to V., at least three of them have asked him to succeed them in their ashrams or missions. Anyway, all that was to introduce you to the man. The event that was particularly notable over the summer, however, was his intervention in a Christian-Hindu riot in the Mangalore area. This is an unfortunate thing that has been going on in India this summer, with Orissa being the beginning, but the anxiety of Hindus about Christian conversions growing and spreading. When a militant Hindu sannyasi in Orissa was killed, things flared up in the Mangalore area as well. The Christians in Mangalore have been successful in evangelizing the poorer outcaste and tribal people of southern Karnataka, to the point that they represent a considerable percentage of the population. The state government is led by the Bharatiya Janata Party, the Hindu nationalist party, and they seem to have decided that it is in their interest to have such turmoil going on under their watch. Whatever the case, they have been either unwilling or unable to put a stop to it, much to their shame. Vachananda was introduced to some of the perpetrators of the violence, militant youths from the Bajrang Dal or RSS, and managed to persuade the that their approach was misguided. He said, "Look, the Hindu gurus and sadhus sit in their ashrams and try to attract wealthy patrons. None of them are interested in doing outreach programs to help the poor and uneducated. The Christians are doing that kind of work. So how can you blame them if these people turn to Christianity. They can see who is helping them and who is not. So if you really want to do something, then you should try to compete on this level." These youth were convinced and organized a meeting with the Hindu sadhus of the area, which was reported in the media. Christian leaders heard of the initiative and came to see Vachanananda to thank him for his efforts. This led to a meeting between Hindu and Christian leaders and a truce of some kind being agreed upon. This in turn led to a lull in the violence in that area, but it appears that things have flared up again since he returned here. Anyway, I was glad to hear that he had the good sense to attempt to make peace rather than follow this unfortunate and extremely shortsighted path of narrowmindedness and violence that so many Hindus -- indeed, fundamentalists of all stripes -- seem to be taking these days. 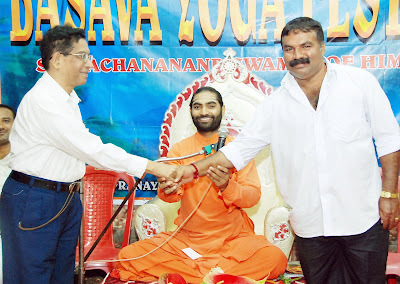 It looks like Vachanananda Swami has a good future ahead of him, and I hope that he continues to make peacemaking and setting Hindus straight on their priorities a part of his agenda wherever he goes. Another short anecdote from Gangesh Chaitanya. He was in Vrindavan for a while and stayed at the Kunja Bihari ashram on the Parikrama Marg near Purana Kalidaha. Amongst the various kinds of seva he did there, one thing was to go and collect cow urine at the Iskcon Goshalla. This would then be used for various kinds of purification rituals in the ashram, sprinkling here and there, etc. Since the object was purity, the person collecting the urine had to be ritually pure himself. So Gangesh would bathe before he went, etc. His being a young brahmachari was part of his qualification for the job. He was told, however, that if he had a nocturnal emission, he had to tell the people in the ashram and that would disqualify him from going on that day. Someone else would be sent and this replacement would have to bring back not only cow urine, but a steaming fresh cow patty as well. Gangesh would then be made to sit down near the well and the cowdung would be placed on his head and flattened. Then someone from the ashram would pour buckets of water over his head in such a way that his entire body was covered with the dung. After the purification bath, he was again eligible to go and collect the cow urine. I also heard that Swami vachananandji stays in Malleshwaram. Even I saty in malleshwaram. I would like know about details about classes morning/evening as I am working looking for suitable timings. please let me know whether any CD's or books of swamy vachananda's yoga is available in the market. You will get all the DVDs, Books, Instruments etc. at the SHWAASA Ashram. Yes, please let us know if we can find a CD of vachananda swamiji's yoga sutras any where. There is a DVD called 'Yoga Yoga' avail in market. Please check this link, this may help you. Sir, you have penned a wonderful bio-sketch of the Swamiji. I am fortunate enough to have him with me as room mate in my college days in Dharwad. Those were the wonderful days in our life. It is good to read about his progress through your matured writings. I could feel your fine attachment with the pontiff. Keep writing. Hello sir, I can see the yoga yoga guru programme in TV9 Kannada. SHWAASA, No. 108f, MLA LAYOUT, RMV STAGE II, BOPASANDRA, NEAR HEBBAL, BENGALURU - 94. You will get all the CDs, Books, Instruments here. sir iam 35 year iam geting wrinkles on face please help me. Do let me know if you are interested and we will be happy to help! My name is rukmini. I am sufferring from sleepless night always since 14 years. My age is 43. Kindly suggest the medication. Kindly give your address. U am residing at Indiranagar. Near to my place, any yoga class is conducted. Kindly advise us in this regard and oblige. My cousin is suffering from spinal chord problem. Plz suggest me when u will be available? You can meet Sri Vachananand Swamiji personally regarding this problem at his Ashram. 3.Yoga to Eliminate Stress /Tension. 4.Yoga for Arthritis & Joint Pain. All the DVDs are available at Reasonable prices. i need ashram address & contact numbers for my relatives regarding heart problem. Please provide us your Ashram address and contact for an appointment. 1. Yoga for Healthy Heart. 3. Yoga to Eliminate Stress /Tension. 4. Yoga for Arthritis & Joint Pain. 7. Yoga for Spine Problem. May I know yours ashram address. I need your ashram address. my email;vsmysore@yahoo.com. i am waiting for the answer.